Spinach is amazing. It is loaded with calcium, iron, and vitamin C. My family eats spinach for breakfast 2-3 times per week. 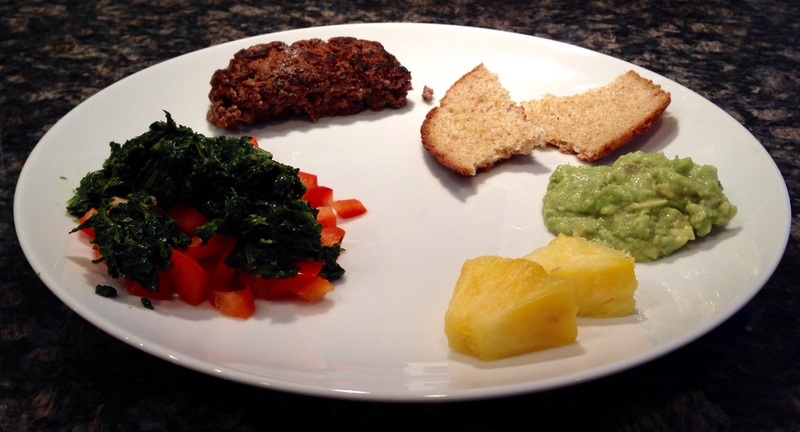 Above is a picture of a typical breakfast in our home: organic, grass-fed burgers, organic pineapple, smashed avocado (see recipe on blog), whole wheat bread, and sautéed spinach with diced organic red bell peppers. Note the portion sizes. Use the recipe below and you will be shocked at how easy it is to make healthy, delicious spinach a regular part of your diet! 1. Squeeze garlic through press onto butter and allow to rest 10 minutes on a spatula or wooden spoon. 2. In a medium pot, bring 1-2 cups of water to a boil. Place a fine mesh colander into pot, suspended above water. Add frozen spinach and cover with lid. Steam spinach for 5 minutes. 3. Remove colander with spinach and pour the green water from pot over the spinach. 4. Pour olive oil, butter, and garlic into pot and cook for 1 minute over low heat. 5. Gently press excess liquid out of spinach. Add spinach to pot with a three-finger pinch of salt. Stir everything together. Serve over diced bell peppers for added crunch and a nutritional boost. Enjoy!